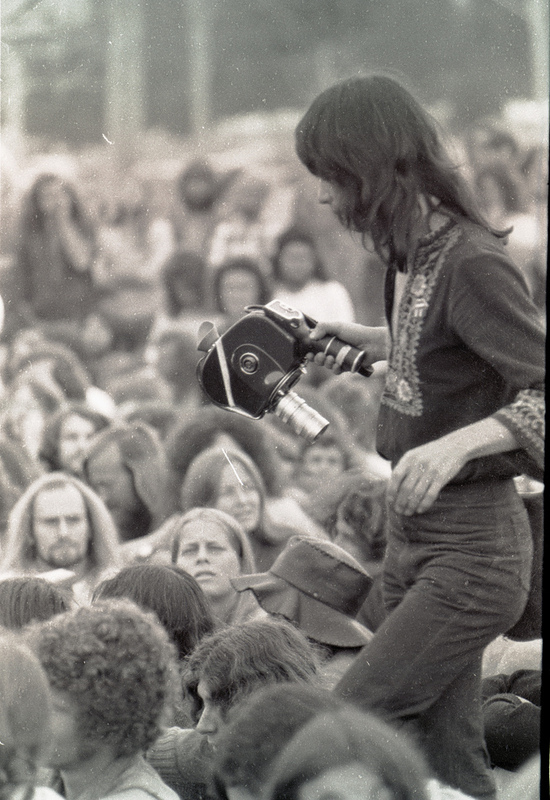 This is a photo of John Moyle carrying a Beaulieu R16 camera at the Nimbin Aquarius Festival in 1973 (photo: Harry Watson Smith). John was part of a collective of filmmakers ariving from various parts of Australia who shot 16mm film at the Aquarius Festival. They worked with a modest grant from the Experimental Film and Television Fund which was the first of the new film assistance schemes to be implemented in the early 1970s. From its inception in 1970, The Australian Film Institute (AFI) managed the fund until 1977 when the Australian Film Commission (AFC) assumed control of it. The film "collective" was comprised of Peter Gray (Brisbane), Bronywn Barwell (Brisbane), Sam Meredith (Brisbane), Brendon Stretch (Sydney), John Moyle (Sydney), Diana Kearns (Sydney) and Andy Trenouth (Adelaide). The filmmakers wanted to get away from the standard approach to filmmaking by not having a single director or specifically assigned crew. Rather, the idea was that the available film stock was divided among them and they would each shoot their own view of the Festival and then later combine everything together to make a group or collective feature film. Due to lack of funds this plan was never fully realized but several of the individual films have survived and are streaming in this archive. See tiles 1D, 2A and 2B and also several audio streams recorded during the Festival 4B, 5B, 5C, 5D, 6A, 6B, 6C, and 6D.